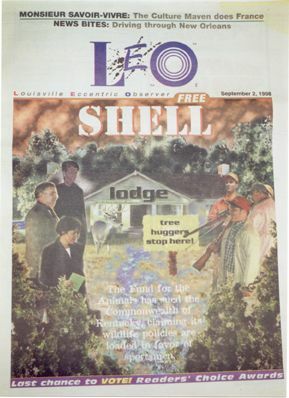 The Printed Work on this page is from the Louisville Eccentric Observer (LEO), a local newspaper/magazine. I work for them as a freelance cover designer. LEO is a great way to show your creative side in graphic design and as you will see below the covers have my distinctive style to them. All photographs were taken by myself. Except for the one mentioned. 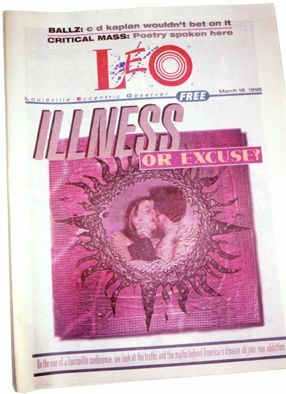 If you would like to se what the image looked liked before it was printed on newsprint check the computer design section in the Red Gallery. Thank you LEO for allowing my creative side to be printed for Louisville to see. 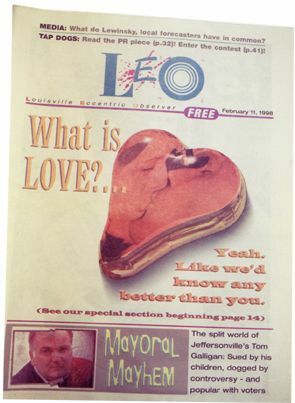 The first LEO cover I completed. My image is on the bottom of the page, it was about a corrupt mayor. I used a picture LEO gave me and made it look as if he was 2 faced by altering half the image with photoshop. 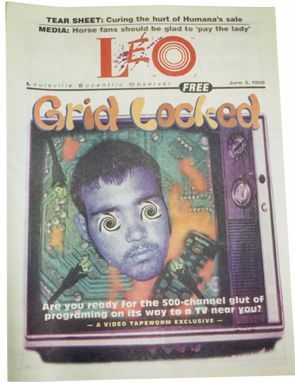 This LEO cover was about how people would react to the new 500 channel cable network in the works. 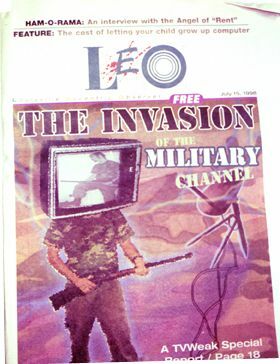 Another LEO cover about TV, this time about the new military channel. Watch out for big brother! 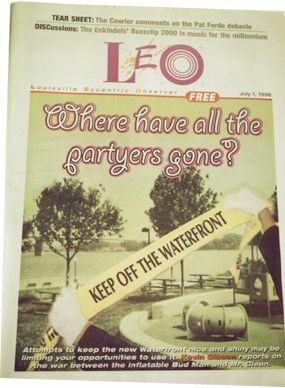 A LEO cover about a new park that was put in downtown Louisville, but the public wasn't at first allowed to use it? 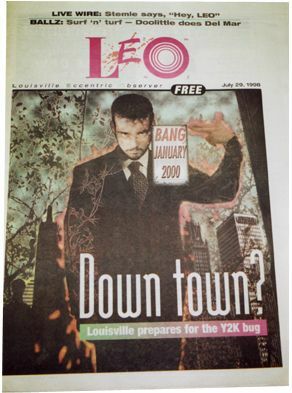 A take on the Y2K epidemic and how it will affect Louisville. Let the conspiracy begin!!! 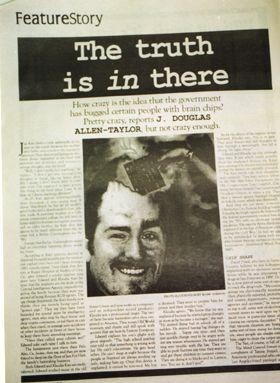 This one was about people who think they have government implanted chips in their heads. Could it be you? 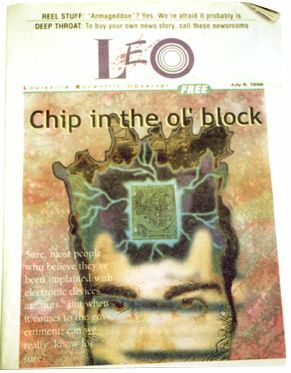 Inside artwork for the Chip in the ol' block story. A cover about why the worlds children are behaving badly. 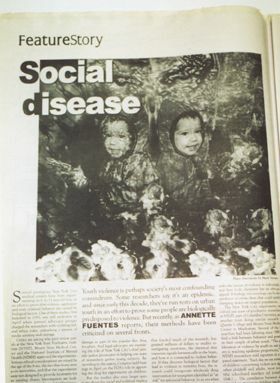 Inside artwork from Nature vs Nurture. I personally liked this color version much better than the one they chose to use as the cover. But unfortunately I had a bad computer day and lost the color file to put on this webpage. A cover about the environmentalists and the hunters. And who was on who's payroll. 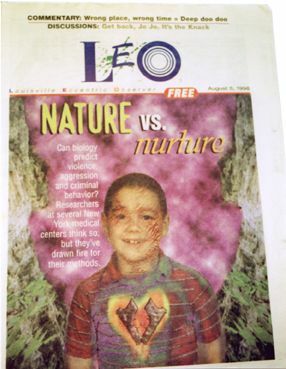 This was the second cover I completed for LEO. It was about sexually addicted people. Thanks to Bill and Gerri for being my models. Inside artwork for the Sexually addict story.